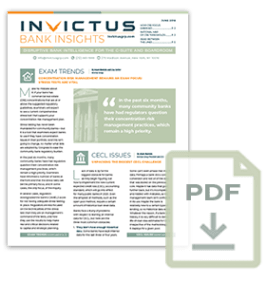 Banks with more than $50 billion in assets are subject to the Comprehensive Capital Assessment Reviews (CCAR) and the Dodd-Frank Act Stress Tests (DFAST), while banks with more than $10 billion in assets but less than $50 billion are only on the hook for DFAST. The primary difference is that CCAR requires banks to overlay their planned capital actions for the next 9 quarters, and DFAST looks at the ‘run rate’ for capital activities, such as dividends and stock repurchases. The economic scenarios are the same, although banks are urged to apply them as appropriate to capture the idiosyncratic nature of their footprint and business model. 1. The Severely Adverse Case scenario now includes a negative interest rate environment. In a scenario that assumes GDP contraction of 6 percent, a spike in the unemployment rate to 10 percent, and 30 percent declines in housing and CRE prices, the Fed is also modeling in a decline in the 3-month Treasury rate to -0.50 percent and the 10-year Treasury rate falls to 0.25 percent. In other words, the Fed is floating a trial balloon of creating a negative rate environment. Don’t expect the Fed to wait for things to get this bad before it pulls this type of tool from the toolkit. A negative rate environment would have a major impact on community banks on all sides of the balance sheet. It would represent a significant drop in liquidity and the widening of credit spreads in other securities. At the same time, banks could experience a new surge in deposits as money looks for a place to hide. Community banks need to learn to be nimble and be prepared for a negative rate environment (irrespective of it being paired with an economic downturn). If you’re not talking about how your bank would handle and perhaps find ways to be opportunistic in this scenario in the boardroom, you should be. Banks should also enhance their analytics at both the granular ALM level and the strategic and capital planning level to assess these types of scenarios. A 25 percent decline in home prices would suggest a return to prices that existed in approximately September Homes underwritten in the pre recession period of December 2004 to July 2008 (ignoring seasoning), and between June 2014 and the present, would have upside down LTVs. A 30 percent decline in commercial real estate prices would imply a return to prices that existed in April 2011, August 2008, and May 2006. Many of the more recent CRE transactions would have been originated in environments with higher CRE indices. The widening of the credit spreads (ie. 10-year BBB bonds less 10-year US Treasurys) from approximately 200 basis points to 500+ basis points — and the increased likelihood of a liquidity crisis — will show many more banks with OTTI credit-based securities losses negatively affecting capital. Negative interest rates, other than occasional money market or repo market distortions, have never occurred in the U.S. With spreads already compressed and depositors showing rate fatigue, the likelihood of charging a depositor to keep his deposit at your bank is about nil.In short, the Fed is signaling that the longer the current environment continues, the worse the next severe downturn will be. Keep in mind that it doesn’t matter if this scenario ever occurs; your capital requirements will be based upon it, either directly through stress testing, or indirectly by your regulator mandating that you need to maintain a 10 percent Leverage Ratio instead of 8 or 9 percent. 3. Perhaps the Adverse Case scenario should be the new “Baseline”. Although the Fed is quick to cite a third-party (Blue Chip Economic Indicators report) for the ‘baseline’ economic scenario for the next two years, this scenario seems more like a dream than reality. In this “baseline” scenario, GDP growth runs at roughly 2.5 percent per year, the unemployment rate falls to 4.5 percent, property values continue to increase – all in the face of rising interest rates and an increase in the prime rate to 5 percent by the end of 2017. The Adverse Case scenario assumes GDP contraction of 1.75 percent, an uptick in unemployment to 7.5 percent, a 25 percent decline in the stock market, and a 12 percent decline in housing prices and CRE. At the same time, short-term interest rates remain at current levels (no more rate hikes), albeit the 10-year Treasury rate reaches 3 percent and there is a continued widening in credit spreads on corporate bonds. The Adverse Case also assumes deflation in the CPI index, which is a new feature of this scenario – more about this in the next point. We are not economists, but we are already seeing some wobbling in the economy and in capital markets. One could easily reason that this is a more likely scenario than the ‘Baseline’ scenario. It would make for healthy community bank boardroom and C-suite discussion to debate if and how you should adjust your strategic plan accordingly. 4. The change in the Adverse Case Scenario versus last year’s highlights the shift in the Fed’s “worry basket”. Last year, the Adverse Case scenario featured a spike in inflation to 4 percent per annum along with rising short-term rates (3-month Treasuries would exceed 5 percent) and a flattening yield curve. The concern was that quantitative easing would eventually lead to inflation which would cause a shock in short-term interest rates. This year’s Adverse Case scenario is nearly the exact opposite – this time it models nearly a 1 percent decline in the CPI and no change in short-term interest rates. The deflation embedded in this scenario is an acknowledgement of what we’ve seen in energy, copper, aluminum, etc. Deflation plus stagnant nominal interest rates implies increases in real interest rates, which can have devastating effect on your borrowers. What does this mean at the end of the day? Who knows, but it’s a stark reminder that the economy is in unprecedented territory. The impact of the Fed’s monetary policies in response to the 2008 financial crisis is still a mystery – especially to the Fed itself. So tread carefully, and make sure you are relying on sound forward-looking analytics to help navigate your bank.